For a jumping saddle with short billets, you will want to order a long girth. I put elastic at both ends of my long girths for ease in tacking up and to improve fit. 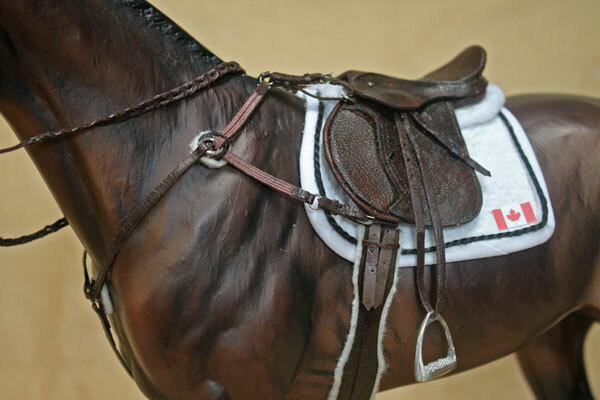 For correct fit, a hunter/jumper long girth should have two holes available at the top of each billet, and the buckles should not be visible below the saddle flap. 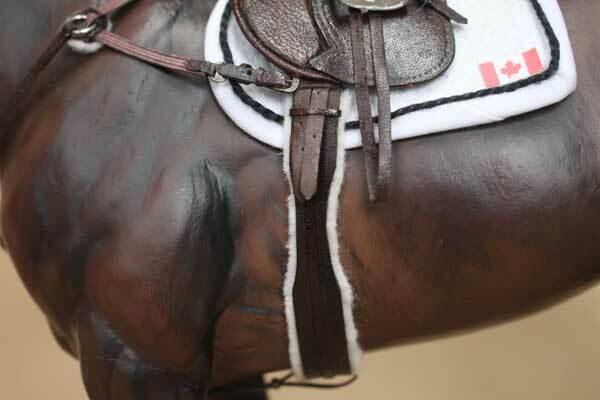 The leather part of the girth should just about come up to the bottom of the saddle flap. Girth size will vary with each horse and saddle. If you wish to use the same saddle for multiple different horses, I suggest getting a different girth for each horse. When ordering, please specify which mold or model horse you want the girth to fit. If you are ordering a girth for a saddle you currently own, please provide the measurement from the bottom of the saddle flap under the belly to the opposite bottom of the saddle flap. 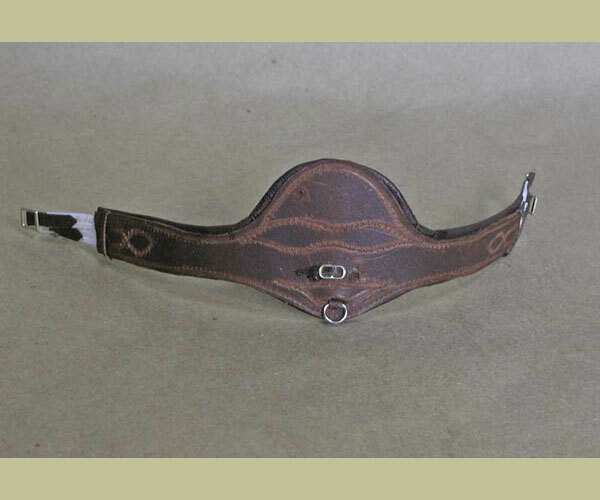 You may choose from a padded leather girth, or a leather lined girth which is a little thinner. 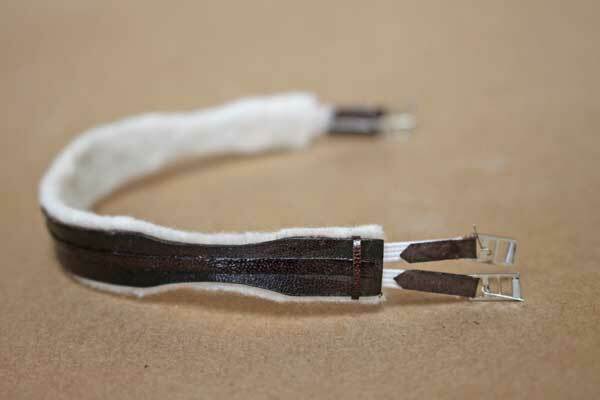 The lining will be made from undyed leather, to prevent possible staining of your model. 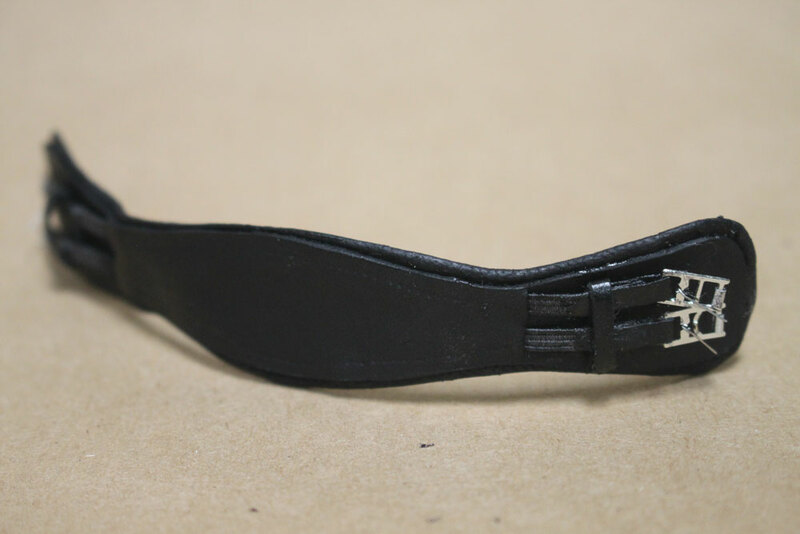 For a dressage saddle with long billets, you will want to order a short dressage girth. My pocket style dressage girths are made from leather covering a stretch elastic girth, and the long billet ends tuck neatly into the pocket covering. Dressage girths should fit with at least 2 holes left on the billets on each side. 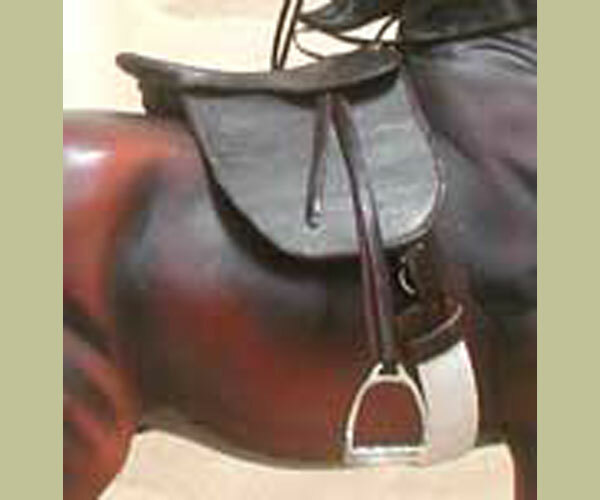 The buckles do not reach the bottom of the saddle flap on either side. Contoured, padded, dressage girth also available, for long billeted saddles. If you are ordering a girth for a saddle you currently own, please provide the measurement described here when your saddle is placed with pads on your horse. 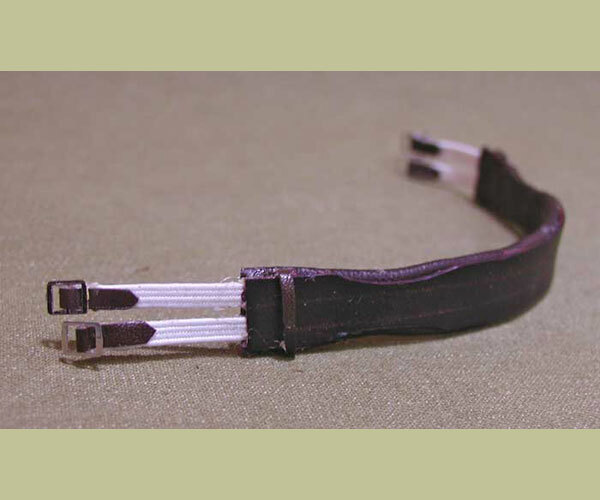 For cut back saddle seat saddles, I suggest an elastic web equalizer girth. 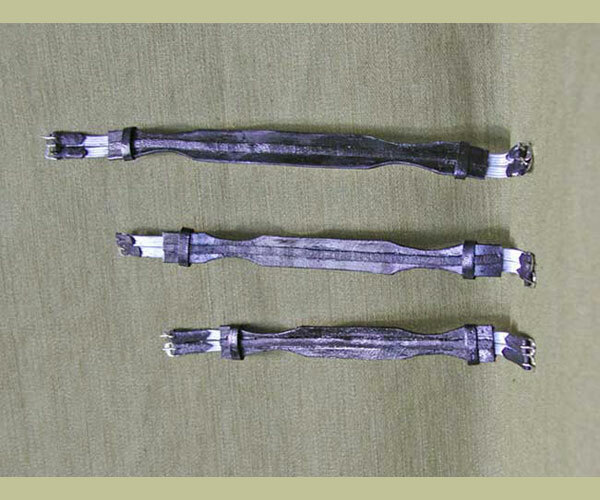 This is a kind of long girth for short billeted saddles, and is measured the same way as the hunter/jumper girth. 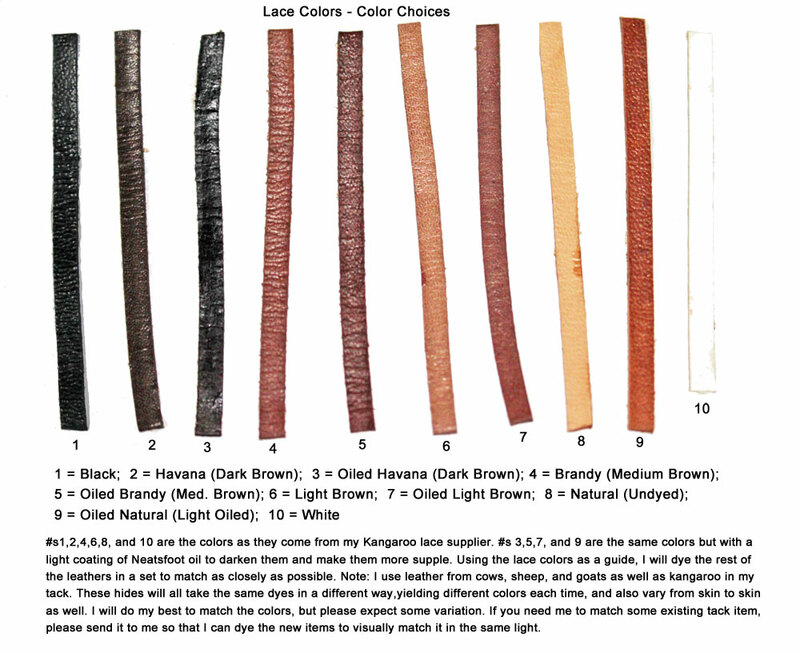 Choose your girth type and place your order from the sections below. 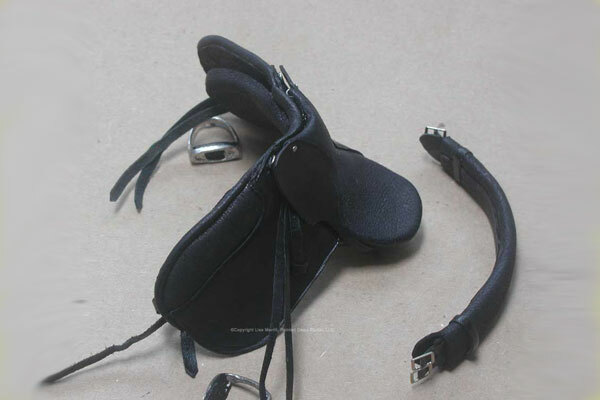 Saddles come with stirrup leathers and metal stirrups only - you will have to order your girth separately. You may need different size girths for different size horses. Jumping saddles typically use a long girth because they have short billets. Dressage saddles use a short girth because they have long billets. Saddle seat saddles usually use a "web" equalizer long girth. You must tell me the size you want, either by the model or mold name of the horse you want it to fit or by taking a measurement. For instructions in taking an accurate measurement, see the Info page. *If ordering a lined girth, please indicate if you want fleece or leather lining by typing it in the size measurement box. Use for any girth on this page! Dont' forget to order your saddle pad!